Many of the build components were actually carefully selected, "found-objects" (obtained from shop stock or outside vendors). Key components such as the objective lens, ruggedized/weatherproof LCD finder, and laser optics, were given special attention in order to communicate a sense of authenticity. For instance, the laser optics were multicoated by a local optical lab to obtain the exact, authentic, blue/violet refection, as exhibited by the real equipment. 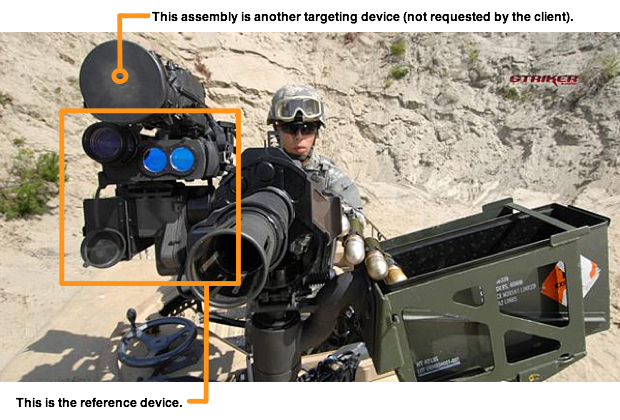 Additionally, being ultimately mounted to a simulated (gas-fired) automatic grenade launcher, required that special emphasis be placed on ensuring sound structural integrity, and cosmetic durability. This project went very smoothy, and was well received by Production. Unfortunately however, the scenes that heavily featured this prop were cut from the theatrical release of A-TEAM for editorial purposes. This resulted in its appearance being limited to a few brief seconds in the deep background. Oh well!… It's not the first, nor the last time our efforts will sufferer this fate! The good news is that this prop still exists, and is available to rent (with the simulated, automatic grenade launcher) from the film armourer services company, FELCAN ENTERPRISES.